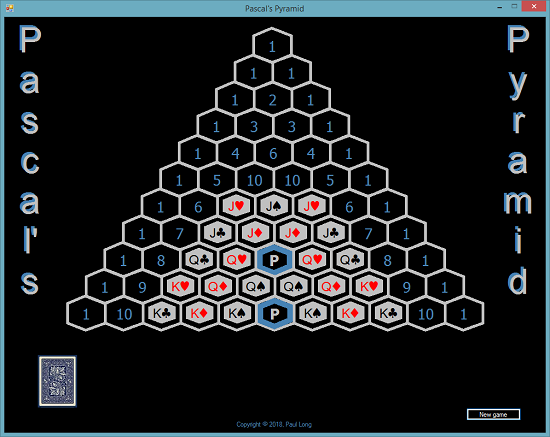 Pascal's Pyramid is an original card game, played with an irregular deck of cards. The game board (or pyramid) is loosely based on Pascal's Triangle, which is a triangular array of the binomial coefficients. Each deck contains 20 aces, 4 each of numbers 2 to 10 inclusive, and 2 sets of face cards, which is 80 cards in total. The aim of the game is to build the pyramid with cards in a predefined order. It isn't possible to play an illegal move - the hexagon cells in the pyramid will only allow legal moves. Each deal from the deck gives you three new cards that you can either use or discard. To deal a new hand you simply doubleclick the deck. To play a card you can either drag and drop it on a cell, or doubleclick the card and it'll play on the leftmost available target cell. There are 64 playable cells in the pyramid. Deck - contains methods for creating, shuffling, and dealing from the deck. FaceCard - used in rendering the pyramid. The top card in a dealt hand is displayed in a draggable extended PictureBox. This game is written in VB2008, to maximise application scope in terms of opening in VB. As such, it'll run in any version of VB from 2008 to 2017, only requiring a minimum of 3.5 Framework. This extended PictureBox Control allows (and disallows) dragging, and raises a Dropped Event when released. Doubleclicking the extended PictureBox will 'play' the displayed card to the first legal available target cell. The Move Event is used for highlighting target cells, when the card is dragged over them. The custom Dropped EventHandler notifies the Form when a card is dropped. This represents a playing card and contains just a constructor and three ReadOnly Properties - Suit, Value, and Image. This represents the deck or collection of playing cards and has a default constructor, one ReadOnly Property, two Public methods, and one Private method. These methods create the deck, shuffle the deck, and deal out cards from the deck. Also the Cell Class has a Boolean cardOver Function, used along with the Properties when matching Cells to Cards. This is used when rendering the game board. The images are silver hexagons with either J, Q, K and a suit character. The ReadOnly Suit and Value Properties are used when setting up the triangular Cells array in the main Form.